The Niagara District Bank was open from 1853 to 1875. It was the only chartered bank with its main location in St. Catherines. The bank also had locations in Ingersoll and Port Colborne. The Niagara District Bank ultimately merged with The Imperial Bank of Canada. Our guide below has more information about bank notes from this institution. The first type of currency issued by The Niagara District Bank was dated as 1 May 1854 or 1 July 1854. These notes were printed by Danforth, Wright & Co., New York & Philada. One, two, five, and ten dollar bank notes were issued. You are most likely to find $1 bills that have been raised to look like ten dollar notes. However, with that said, really all bank notes are rare even if they are raised. These are also very rare. There are several varieties based on whether or not the note has a partially or fully engraved date. One, two, four, five, and ten dollar bank notes were issued. Most of these exist today as proofs (like the $10 note below). Proofs are always worth less money than issued bank notes. 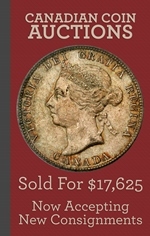 There are lots of 1862 $4 counterfeits. Counterfeits are usually worth around $100, so don’t just assume they are worthless. On the other hand, issued bank notes should be worth thousands of dollars. Contact us for details. These notes can be dated as July 1st 1872 or 1st July 1872. These are also extremely rare. 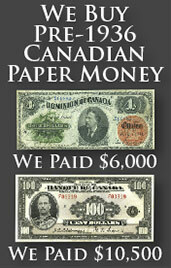 This time the British American Bank Note Co. Montreal & Ottawa got the printing contract. They printed four, five, and ten dollar bills for The Niagara District Bank. Each note is signed by James R Benson and either F.W. Gibson or C.M. Arnold. There are reproductions of 1872 $4 and $5 bills out there. Contact us if you aren’t sure whether yours is authentic or not. We buy all types of Canadian currency. We are especially interested in bank notes from The Niagara District Bank in St. Catherines. You might be surprised at how much money we can offer for some currency. Most all bank notes should be worth thousands of dollars. Send us an email with pictures of the front and back of your bank note and we will respond quickly with our offer. Your piece of currency from The Niagara District Bank in St. Catherines could look similar to the one seen below. Plenty of other varieties do exist though. Contact us for more value information.